For Lunar New Year 2018, I did a quick digital painting of Rare's Kim Wu from the fighting game Killer Instinct who is part Chinese and part Korean. 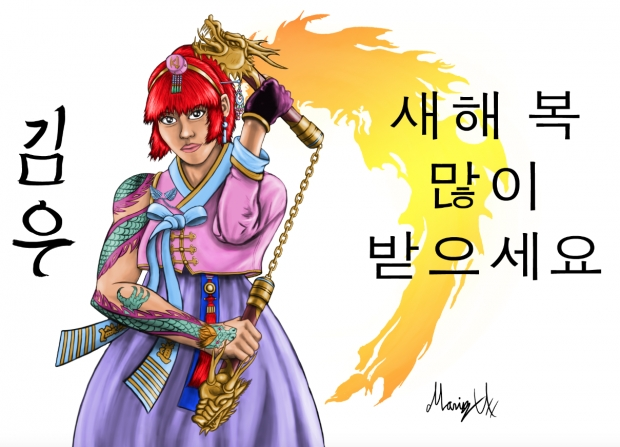 Since the PyeongChang 2018 Winter Olympics are going on, I choose to put her in a traditional Korean Hanbok to show her South Korean even though her fighting style is Bruce Lee's Jeet Kune Do and wears a chinese Cheongsam. Her theme is also a rock version of Arirang, a famous Korean Folk song. The letters on the left is Kim Wu's name in spelled in korean and the right is an expression that say happy korean new year.